New York’s University at Buffalo sophomores are getting a new “learning landscape” in the form of a environmentally-friendly residence hall. 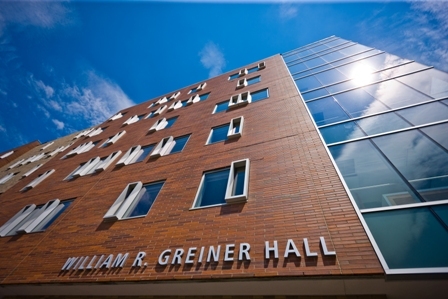 Greiner Hall, a 198,500 square-foot building that can house up to 600 students, includes quirky design elements and cutting edge energy-saving features. Together, they make the building eligible for a Leadership in Energy and Environmental Design (LEED) Gold certification, according to university officials. The facility embodies the “learning landscape” concept in the university’s UB 2020 strategic plan, which encourages continual student learning by creating an environment that supports discovery outside the classroom. The hall is for sophomore students who are looking for more privacy as they enter into their second year of college. The building unique features include, high efficiency lighting, low-flow shower heads and faucets, reflective roof for cooling, a landscape irrigation system, bamboo plywood walls harvested from sustainable materials and counters and flooring made of post-consumer waste, like recycled soda bottles. Outside the hall, detention ponds, called “bioswales” catch and maintain rainwater from the roof and other hard surfaces, preventing the water from going into the sewer system. The usability and design components of the $57 million building will be tested as part of a research project that the University of Buffalo’s Center for Inclusive Design and Environmental Access (IDeA Center) is conducting with the goal of evaluating and improving new universal design standards for public buildings.